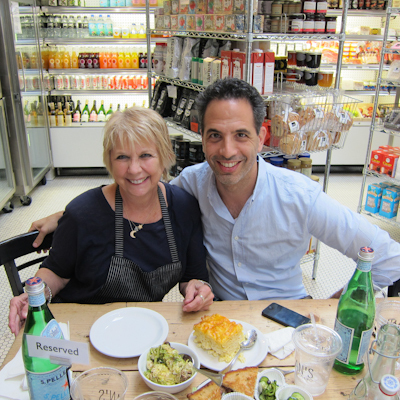 A few weeks back I was lucky enough to spend time with Yotam Ottolenghi for a couple of days when he visited Los Angeles. Every time I meet a new chef it’s always fun and interesting – but when that person is someone I’ve admired from a far for a long time it’s even more thrilling. Plus he’s such an intelligent and gracious person it’s just easy being around him. Yotam lives in London where he has many Ottolenghi cafés and his new restaurant NOPI. I try my best to keep up with what is going on back in England and always enjoy a visit to his place when I’m back. I can’t wait to visit at the end of August when I am in London – dinner at NOPI a must.. He arrived and fresh off the plane we headed over to Joan’s on Third to have a late lunch with Joan. As well as her Mac and Cheese – which she explained is based on a family recipe that would basically use any old cheese in the refrigerator. Now that it’s a staple at Joan’s on Third she has had to develop the recipe and make sure it’s consistent. We also enjoyed the farro with butternut squash salad and then followed it up with sweet treat after sweet treat. Before heading back to Joan’s office so that Yotam could sign her book – that was lovingly tagged with hundreds of post it notes. 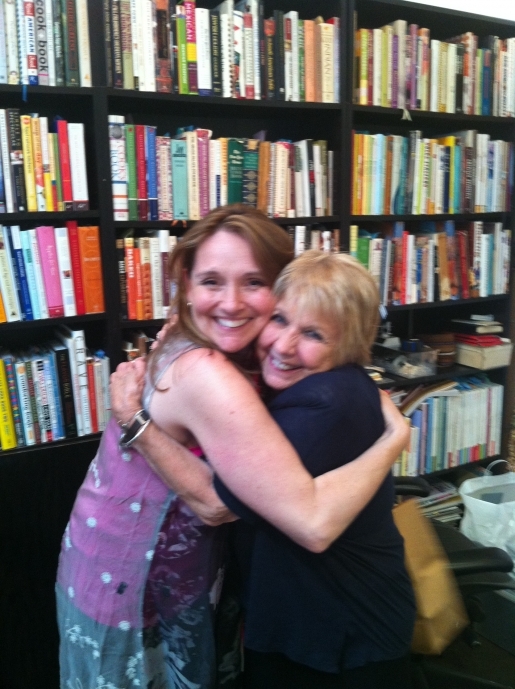 Hug time – just look at all her cookbooks in the shelves behind – HEAVEN! 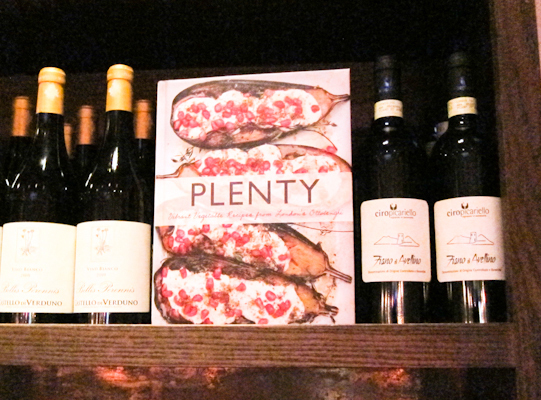 On the Thursday night Animal went Vegetarian – cooking from his book Plenty, recently published by Chronicle Books in America. I have cooked from Plenty, and before this the Ottolenghi Cookbook many times. I would say it is one of my most used cookbooks of all times. The recipes are so easy and straightforward and yet the flavor combinations are so new and refreshing – a simple Caprese salad is transformed by toasting fennel seeds and marinating the mozzarella with these and lemon zest in olive oil. 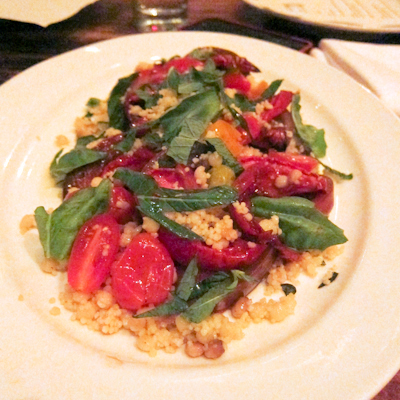 The first dish was the tomato party – the genius thing about this recipe is the juxtaposition of the two sizes of couscous – regular couscous and the larger fregola. Fregola is a type of pasta from Sardinia, similar to Israeli couscous. 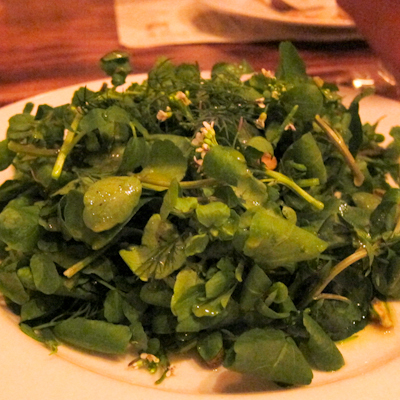 Next up one of my favorite salads from the book – the watercress, pistachio and orange blossom salad. With a zucchini and hazlenut salad, lentils with broiled eggplant, carmelized fennel and then lemon and goat cheese raviolis it was a delicious feast. So fun to have these dishes made under Yotam’s watchful eye by Jon and Vinny at Animal. Last up was a delicate milk pudding – sadly the only item on the menu that isn’t in the book – will be asking Yotam for this recipe immediately. Here Yotam poses for a photo with the Mother Forkers (my cooking group) – we’ve cooked from his book many times and you can just see how pleased we all our post dinner! Yotam sat at our table signing book after book – each one carefully dedicated with a short sharp sentence or two. In mine he wrote “Thanks for sorting me out in LA.” Anytime – it was a huge treat and I enjoyed every minute. 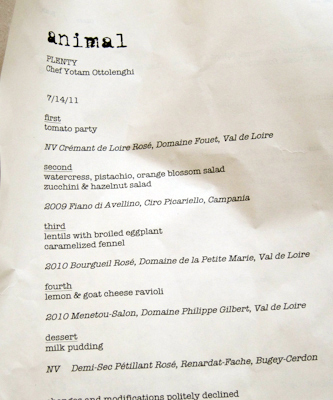 And a HUGE thank you to Animal – in particular Jon, Vinny and Helen for hosting Yotam for this very special dinner. The next day Yotam had breakfast at Farmshop and then a book signing at Anthropology in Santa Monica. In the evening we all gathered for another dinner – this time at the ultra chic private members club Soho House. 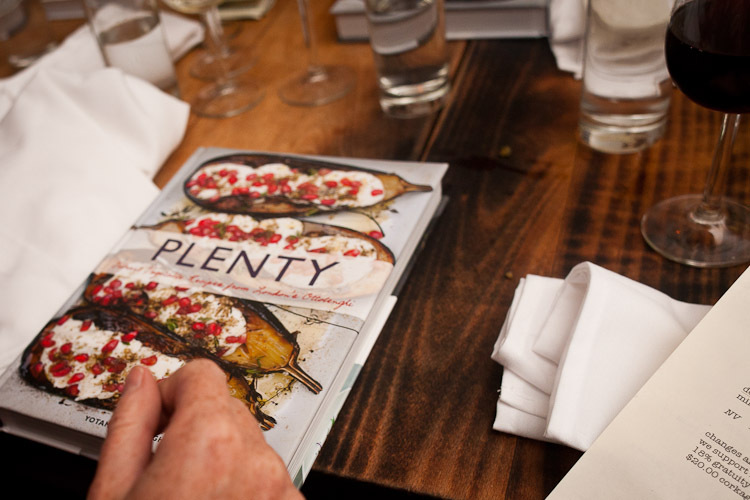 More tomato party and then a series of other salads and vegetable dishes – including the delicious eggplant with buttermilk dish that graces the American cover of Plenty. Sadly I don’t have any pics – they have an extremely strictly enforced no photos up at the club policy – which is particularly sad because each dish was prettier than the last. Plus, as the full moon rose over downtown with the light fading we all sipped champagne and gathered around the long table for 70 people – trust me it was very stylish. I had the pleasure of sitting next to Mary Sue Milliken and her charming husband. My date for the evening was the lovely David Hawk of Chronicle Books who was given the job of guarding Yotam’s wine as he mingled with guests and signed yet more copies of his book. « My Book Has Arrived! What a neat book and wonderful group of people!! 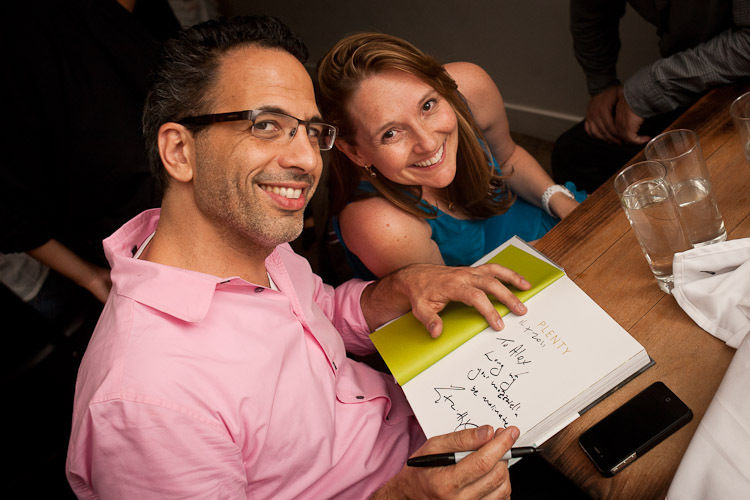 I can’t wait to get my hands on the book “Plenty” I have always been intrigued by Ottolenghi and now knowing he is such a sweet guy I must learn more about him. Gorgeous food you both shared. 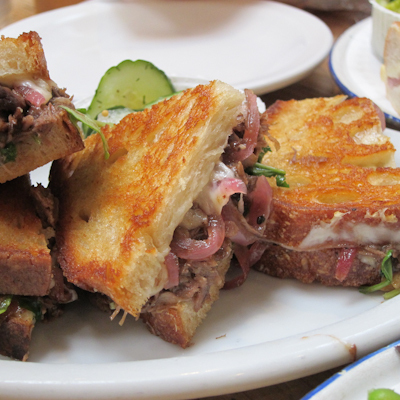 That grilled cheese is gorge….do I see pickled or caramelized onions in there? I have said it before and I will say it again – “I am coming back as you in my next life”. 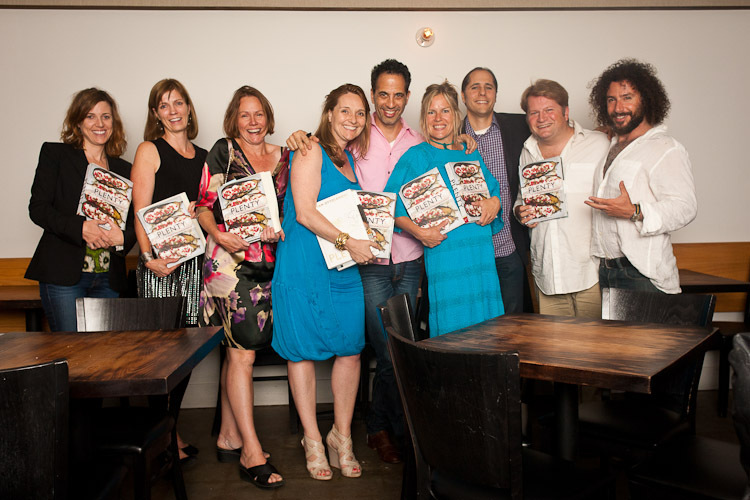 Wonderful recap of your time spent with Ottolenghi – what a wonderful culinary tour of L.A.! That sandwich seriously made me drool. I loved pickled onions on a sandwich! Looks like such a fun time you had. What a fab experience. I love Joan’s on 3rd too!